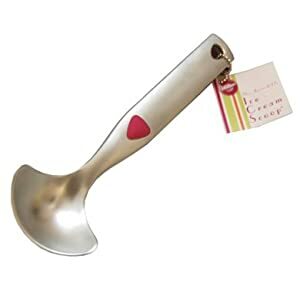 I wanted to do a product review for everyone ---- I recently bought this ice cream scoop off Amazon. My sister in law was the reason behind me buying this scoop ---- I used it at her house one day and was blown away by how easy it was to scoop the ice cream! My biggest weakness (in regards to food) is ice cream. I love ice cream and always have at least one pint in the freezer, but I hate having to break a sweat to scoop a bowl. We went cheap on our last ice cream scoop and it actually broke! This is a dream and just slices through the ice cream. Although I did not realize until I had it, it is not stainless steel so over time it will wear away. So just keep in mind you may not want to stick it in the dishware to help prevent wear and tear, or find one that is stainless still. The one I bought was just $6.56 and I got free shipping thanks to Amazon since I had other things in the order.